​ Adrian Lam knows counterpart Steve McNamara well... he used to coach the Catalans coach’s son! Ben McNamara played at Lam’s Clovelly Crocodiles junior team when his dad – the former England coach – was on the Sydney Roosters staff. “I coached Ben for two or three years, I think it was,” recalls Lam. “He’s a great player, and he’s in the north (at Hull academy), I’ve tried to get him here to Wigan. Catalans head into the game searching for a third straight win following narrow victories against Hull KR and Leeds. They have bolstered their squad with the early-season addition of Sam Kasiano from the NRL, and McNamara has named seasoned campaigners fit-again Greg Bird and Sam Moa in his squad. Of course, it is another Sam who will get the most attention. Tomkins is set to make his first return to the club where he became one of the modern game’s superstars. “He’s a legend in this town and at this club,” said Lam. “He’s coming in different colours this time around, so we will make him welcome with open arms and then do our part to make him feel like he’s part of the enemy. “They showed last year in the Challenge Cup that they’ve got it in them to win big matches, and since then they’ve added Sam Tomkins and now Sam Kasiano, so they’re in a good position. They can power over sides and they have the offloads in them, too. 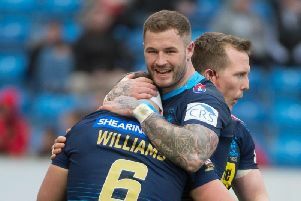 Wigan’s win at Salford last weekend lifted the gloom which had descended with a five-game losing streak.